Best Lifts:Squat 530lbs. Bench 425lbs. Deadlift 655lbs. Total 1595lbs. Goals:Squat 700lbs. Bench 500lbs. Deadlift 800lbs. Total 2000lbs. Inspiration:To Lift my best at the USAPL Nationals against the best drug-free 198'ers in the country. 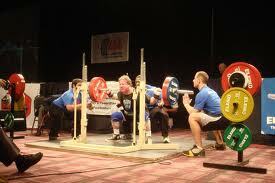 Powerlifting Quote:"The Deadlift is the MONEY Lift!" ThanksI want to thank my wife Rhonda, my Training Partners/Handlers Jerry Clark and Eric Edwards and my entire family for their support. I thank God every day for my strength. I qualified for Men's Nationals again this year and plan to go well over 1600 there and be in the top 3 Deadlifters again. The USAPL is a great organization and runs the best meets I have ever lifted in.